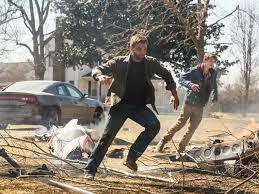 Under the Dome (the television series) is based on a novel written by Stephen King of the same name. The teleplay was scripted by Brian K. Vaughn (of Y: The Last Man fame). Seeing that the script was written by someone other than Stephen King himself, and knowing (loving) Y: The Last Man, I was excited for the possibilities that could be brought out in an adaptation of Under the Dome. An invisible force field descends upon a small town in the northeastern part of the United States. 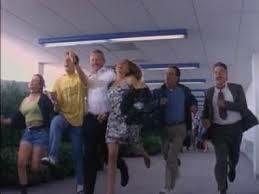 Dale Barbara, Iraq vet and now a short-order cook, finds himself teamed with a few intrepid citizens - town newspaper owner Julia Shumway, a physician's assistant at the hospital, a select-woman, and three brave kids. Against them stands Big Jim Rennie, a politician who will stop at nothing - even murder - to hold the reins of power, and his son, who is keeping a horrible secret in a dark pantry. But their main adversary is the Dome itself. Because time isn't just shot. It's running out. I would say that spoilers are about to be mentioned, but guess what, there's a dome in Under the Dome and all that stuff mentioned in the synopsis begins to happen. This is more-or-less an introduction to the townsfolk of Chester's Mill, and little besides the dropping of the dome happens. I was excited for the possibilities... then I saw this photo. 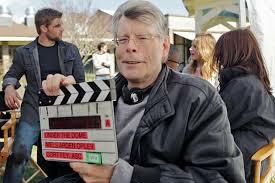 Stephen King on the set of the show. If you are familiar with other adaptations of Stephen King's works (The Langoliers, The Stand, Storm of the Century, Bag of Bones, etc.) you are aware of how campy the stories become. But Szever, The Shining - Jack Nicholson - awesomesauce! Stephen King had nothing to do with that version of The Shining, and has publicly stated his distaste for the adaptation - decided to remake it on his own. Guess what. Not as good. Whether or not Stephen King actually had involvement in writing/directing/etc. Under the Dome, I have no idea, but my expectations were drastically lowered at the thought of the possibility. However, the remainder of the acting ranged from the acceptable to the depths of the dreaded Stephen-King-campiness. We get to see Junior Rennie's descent into madness - a great addition to the script - and it is played adequately well (maybe a little over-the-top, but not quite to the point of ridiculuos). Barbie is played a little darker than the boyscout (though this could just be selective memory - maybe he had that darkness to him in the novels and I just don't remember?). ﻿﻿Julia... no complaints. The children and smaller parts really demonstrate the poorer end of the acting spectrum. Take the Kid-Who's-Probably-Supposed-To-Be-Younger-Than-He-Is. His reaction to the Dome, the plane crash, his communication with Barbie and the authorities, it all felt contrived - like an adult trying to act like a child. This may or may not be the actor's fault, as an actor has to work within the limitations of the script he is given, but these moments pull you from the intensity of what happening. A mysterious dome just trapped an entire town, planes are crashing, cars are crashing, people are missing and/or are dying - everything needs to maintain a level of intensity to keep that feeling of fear and panic and isolation with the audience. The casting of quasi-known actors also doesn't help maintain connection with the story as (atleast personally) I am hit with a sense of "hey, I know that guy from somewhere" (*keys Under The Dome into IMDB*). That moment when you can't quite touch your loved one (if I put Rose there instead of the Doctor I might cry - sorry Under the Dome, you need more development before you can make this effective). And how can we forget diving away from falling wreckage at the last possible second (this just looked absolutely horrible, but alas, Prometheus has shown us that it could have been much, much, much worse)? All griping aside, the pilot of the series was not awful. There was enough suspense and intrigue to draw me back for more (I suppose knowing all that is to transpire helps - though I do hope the explanation of the dome is better in the show). It is what I expect of a Stephen King adaptation, and maybe slightly better than that even (I will never forget the jumping celebration freeze-frame at the end of The Langoliers - you should all suffer this image of campiness too (see below) - mind you, this was a Stephen King story). Long story short (too late), Under the Dome had an adequate if not slightly underwhelming pilot that feeds you just enough mystery to tune back next week. I'll be interested in seeing where the show goes. I am hoping that people love it and we get to see a long series from it!! From what I read, the plan is to stretch the story out over multiple seasons, which would thereby defy the story of the novel (which only took place over a short period of time). So, assuming the ratings stay up, maybe we get a few seasons out of it! Brian K. Vaughn is certainly talented enough a writer to take this to great places. Hopefully it works out.